What do Tender -and Proposaldocuments have in common? Both Tenders and Proposals are the result of organizations using repeatable processes and techniques for team collaboration on writing, reviewing, editting, approving and integrating content, producing that final deliverable. Many Proposal Managers struggle with a bad RFP. Many Procurement Managers struggle with a bad Proposal. One of the major root causes of this problem lies in teams using tools and systems which are not effectively and efficiently supporting them in creating high quality tenders or proposals. If you’re by yourself, writing, reviewing, editting, approving and integrating content you have full control over the quality of the process. Once you invite a participant in that end-to-end process it immediately provides additional complexity and impacts your quality. Imagine having tens of people working on your tender or proposal, creating much more complexity where quality management really becomes an expensive factor. One of the major factors contributing to decreasing quality is the the simple fact that teams, collaborating on tenders and proposals, use tools which are widely available and establish their own systems, accepting those limitations and constraints contributing to these quality issues. Those tools are editors (e.g. MS Word), Document Managament Systems (e.g. 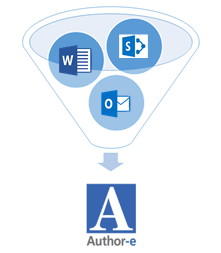 SharePoint) and an email application (e.g. Outlook). What if you could put those uniqiue benefits of each of these 3 applications into a blender and have one integrated system that supports you and your teams working on tenders and proposals? Finding historical data on your corporate document management system. Procastinating & writer’s block issues amoungst teammembers. Teammembers get distracted with discussions related to lack of versioning control. Having pre-written content "boilerplate", ready-to-use content to start with. Watch what happens in real-time, and issue corrective actions. Single Source of Truth; there is only ONE version! Teammembers can retreat in isolation, unsupervised and produce proposal-content which is inconsistent, difficult to integrate not meeting either/or corporate or client expectations. While teammembers create content they simultaneously have the ability to evaluate content provided by their peers and allign accordingly. Tender -or Proposalmanagers are often inexperienced managers who lack authority. Easy to use status reporting to effectively manage the Tender -or Proposalteams and escalation to executive management. Tenders & Proposals management solution?